Develop skills to find satisfaction in each meal and accept your body’s natural weight. Why do we eat? It's more than just a hunger for more food, teaches Geneen Roth. Your relationship with food is a microcosm of your relationship to being alive, and to your beliefs about trust, pleasure, deprivation, and nourishment. 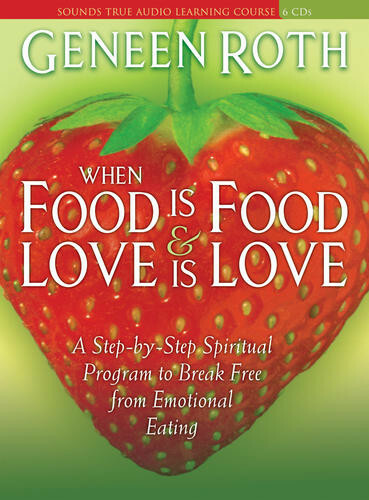 Now, Roth offers listeners When Food Is Food and Love Is Love, a deeply spiritual culmination of her groundbreaking work since the bestselling Feeding the Hungry Heart. Here, she offers her first complete at-home course to break free from emotional eating through visualizations, guided eating and mindfulness meditations, and more. Roth helps us to understand the real issues of why we turn to food, and to experience the freedom from dieting once and for all. I love Geneen's advice, and her voice. The guided meditations on this program have been very helpful to me already. One note of caution, if you do as I do, and listen to audiobooks while trying to drift off to sleep: sometimes the volume gets suddenly significantly louder (with exclamations, not errors in the audio), so this program is not great for that use.